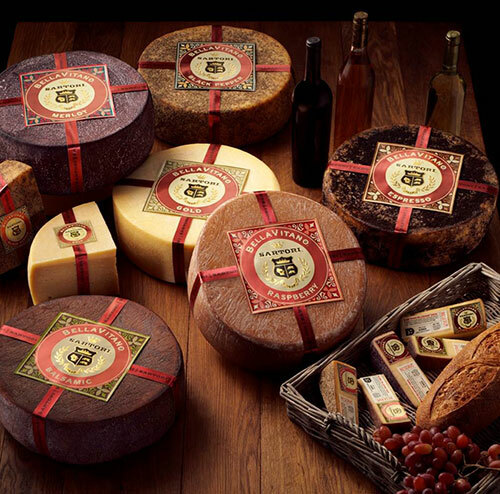 Bellavitano Wheels are available in Raspberry Tart Ale, Merlot, Balsamic, Espresso, Black Pepper and Chipotle. By wedding this rich, creamy cheese to the berry and plum notes of Merlot, we've created a marriage of flavors destined to make your taste buds say, "I do." On that note, if you invite a few friends from our pairing guide — say, toasted walnuts, thin slices of prosciutto and semisweet chocolates for dessert — the honeymoon never has to end. As a delicious treat for your breakfast or dessert, we hand-rub freshly roasted espresso into sweet, sugary BellaVitano wheels aged to creamy perfection. We thank our artisan craft-roasting friends for getting up early to make the coffee — and helping us open the judges' eyes at the World Cheese Awards this year.